DEMERIT (AUS) (Brown 2006-Stud 2011). 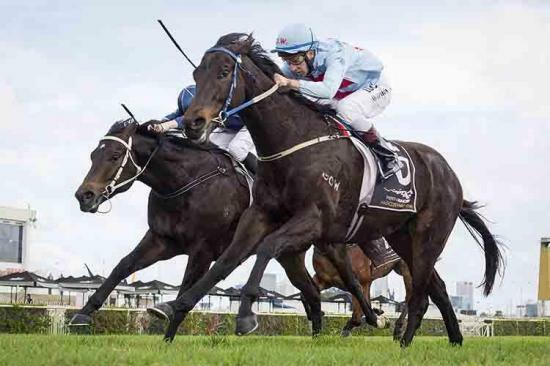 2 wins at 1200m, 1400m, MRC Caulfield Guineas Prelude, Gr.3. Half-brother to SP Evander. Sire of 54 rnrs, 22 wnrs, inc. SP Spangled Impact and of Minus Looks, Puteri Jewel, If Only, Anisau, Bergio, Detango, Hey Listen, Juendis, Recoiled, Miss Somebody, Penalty Point, Skylar Storm, Venus Ebony, Double Digit, Smallamountofmerit, Captivated Point, Dante's Destiny, Don't Speed, Gordon's Cungee, Shuriken Star, etc. Minus Looks (g. by Demerit). 2 wins. See below. Hey Listen (f. by Demerit). 2 wins at 1400m, 1650m in 2015-16, WATC Perth Racing Facebook H., 2d WATC Book Your Next Function H.
Rex the Robber. 10 wins to 1400m, A$117,541, 3d WATC Enterasys Secure Networks H., Barrosa Boy H.
Thieves Like Us. Placed in 2015-16 in Aust. Blakehurst. 17 wins to 1500m, A$147,362, BTC Fanta H., 2d Qld Tatt's RC Carlton H., Foster's H., QTC Santa Claus H., 3d BTC Octagonal H., QBBS Yearling Sales 3YO H., Couran Cove Resort H., QTC Scomeld H., Trentham H., 4th Toowoomba TC Weetwood H., L.
Tanrosa's Boy. 8 wins-4 at 2-from 800m to 1650m, A$77,900, BATC Orlando Gramps Doomben Dash H., Redcliffe War Widows 2YO H., Lee's Lads & Lasses H., QTC Cheltenham H., Affinity H., 2d BATC ABC-TV Flying H., QTC Channel 10 Welter H., BATC Wedgwood Pies S., Galilee H., QTC Bill Edwards H.
Party Hard. Winner at 800m in Aust. Shaponda. Winner at 1350m in Aust. Backpacker. 2 wins at 1100m, TRC Taroona Hotel H.
PAR VALIS (Novalis). 9 wins-1 at 2-from 1000m to 2800m, WATC St Leger, Gr.3, Spring H., Eurythmic Cup, Naval Base Welter H., Edgar Meares Cup, Coventry Welter H., Elms H., Graduation S.-twice, 3d WATC Easter Cup, Gr.3, Belmont Park Cup, L, Tattersall's Cup, L, 4th WATC Supremacy Quality S., L.
Race Record: 5 Starts 2-0-0 A$119,200. 2 wins-1 at 2-at 1200m, A$119,200, to 2016-17, WATC Perth Racing Newsletter 2YO P., Schweppes P.